BioCare Baby A, C, D Plus Drops is a multinutrient formula that presents the key nutrients babies and children require in a liquid form. It’s suitable for both breast and bottle fed babies. Suitable for all children and babies from 1 month. Baby A, C, D Plus Drops provides vitamins A, C and D alongside B vitamins and zinc. Easy to give formula – can be mixed with milk, water, added to food or dropped directly into the mouth. Zinc contributes to the maintenance of normal bone and cognitive function. 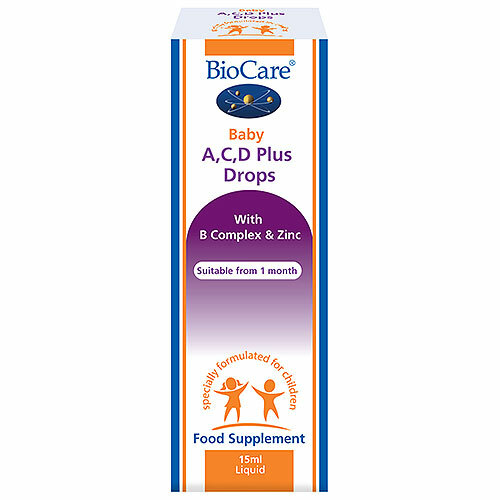 The Department of Health recommends that all children from six months to five years old are given supplements, in the form of vitamin drops, which contain vitamins A, C and D.
BioCare Children`s Strawberry Bio-Acidophilus Plus. If you are under medical supervision, please consult a doctor before use. This product should not be given to infants consuming 500ml or more of infant formula a day, or infants under 1 month unless under medical supervision. Below are reviews of Baby A, C, D Plus Drops - With B Complex & Zinc - 15ml by bodykind customers. If you have tried this product we'd love to hear what you think so please leave a review.